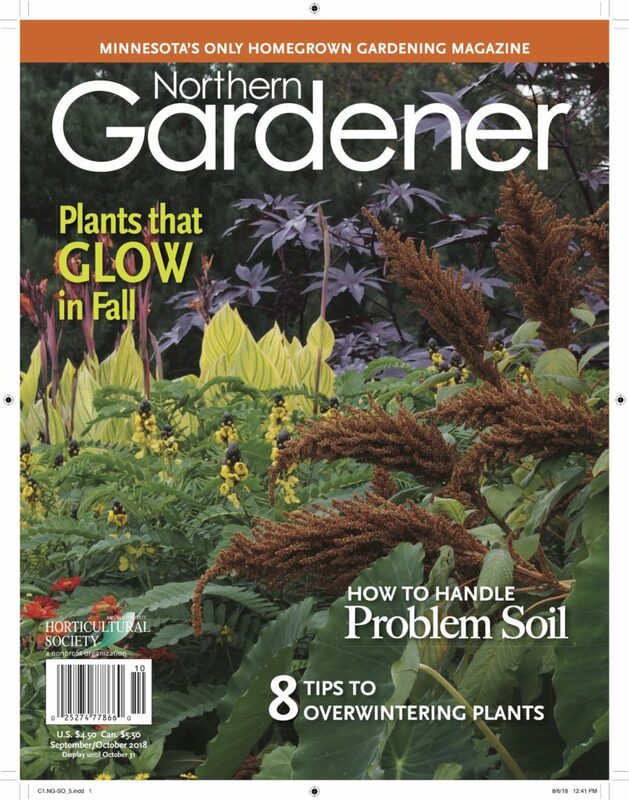 The latest issue of Northern Gardener is on newsstands now (and available for those who sign up for a subscription or join MSHS at the Minnesota State Fair), and it includes articles to keep you excited about gardening all through the fall. Our cover story by Gail Brown Hudson highlights plants that glow in the garden in fall. Adding plants such as cranberry contoneaster, joe pye weed, sedum, asters and many more. In our climate, a garden that bursts into color in fall is inspiring, check out these suggestions for plants to add that spark to your garden. Diane McGann gives us a tour of the garden of Rhonda Fleming Hayes, author and columnist for Northern Gardener. Rhonda’s urban garden has what she calls the “big three” of gardening: a kitchen garden, plants for pollinators and a water feature. Her garden is stylish and so, so comfortable. I’m sure you’ll come away from the article with lots of ideas for your own garden. This issue also includes lots of practical advice: conifers for small space gardens, how to overwinter tender plants, what to do when you have poor soil as well as our columns about everything from saving gladiolus and dahlia bulbs for next season to ways to store produce through the winter. It’s a great issue — perfect for reading when the weather inevitably turns cold.